Distance from the Belsen Heap by Mark Celinscak is a very highly recommended definitive record of the Canadian involvement with the liberation of the Nazi concentration camp at Bergen-Belsen in April 1945. He makes a clear case that this should be considered part of both British and Canadian history. This is a well researched and documented scholarly work, but it is also heart breaking to be reminded of man's inhumanity to man. Celinscak covers the theoretical and methodological foundations of the book. This chapter provides an overview of British and Canadian military movement from Operation Plunder through the takeover of Bergen-Belsen. When they arrived at the camps there were 60,000 prisoners and an estimated 50,000 corpses. Of the 60,000, and estimated 14,000 died after the camp was liberated. This chapter covers what transpired during the first 72 hours after the formal surrender. Most of the men involved were uninformed that there were thousands of corpses and tens of thousands of extremely ill, starving people. 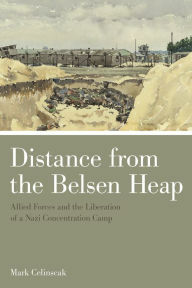 The response of British and Canadian military personal in the weeks and months following the handover of Bergen-Belsen is documented, with an emphasis on the meaning mined by the Allies. Examples of how British and Canadian artists and photographers visually documented the scene. The response of the chaplains and medical personal in the military is covered. Disclosure: My digital edition was courtesy of the University of Toronto Press for review purposes.